After last month's utterly brilliant Shakedown LP (see here) and the upcoming 7 inch Freak Funk Boy under his Greatest Hits moniker (see here), Brooklyn's principal wunderkind Zak Mering aka Raw Thrills already has another recording to be dropped soon via Sixteen Tambourines. 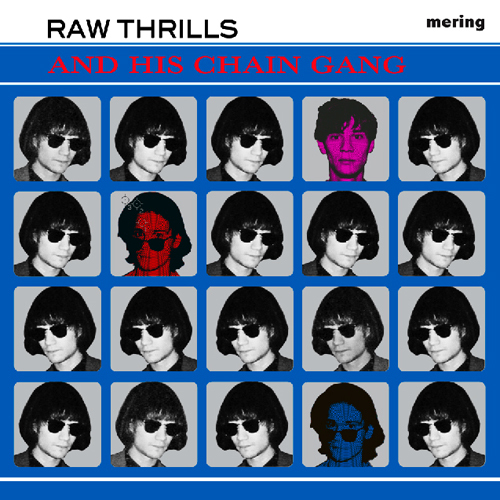 Raw Thrills and his Chain Gang is a 13 track collection of "mostly covers and stuff", including songs with illustrious names such as Mrs. Robinson, Sunshine After the Rain, or Sweets For My Sweet. But as we have been shown before, Mering's reinterpretations of all-time classics are way more than mere apprentice pieces or simple pastime. In fact, his cover of Harry Nilsson's Without Her, featured on the recent So Post cassette, is without doubt one of my favorite Raw Thrills jams. The below premiered My Life Was in Chains, however, is an entirely new song by Mering. Featuring Zak's Sweethearts partner in crime Sam Mehran aka Outer Limits Recordings etc. on guitar, the tune is just another example of Mering's boundless talent for the perfect pop song, filled with his sweet voice and sugarcoated with sampled, nicely off-kilter and skewed strings that leaves us jamming through the early spring sunshine. Raw Thrills and his Chain Gang comes in a strictly limited edition of only 60 tapes, so don't hesitate and pre-order over here Raw Thrills - My Life Was in Chains Oh, and the gorgeous artwork above was done by our very much adored Teresa of Relentless Noisemaker together with Mering.